Privacy is always a concern with social networking and now we have learned that some social networking sites are conducting research on users without their consent. Facebook manipulated content in the feed to see if it changed users emotions while dating site OKCupid changed features in user profiles. Facebook's Messenger App is now required for mobile users who want to use the message service with Facebook. This move created an uproar from users as many people were concerned that the app allowed Facebook to control their phone, access private information, and send text messages without user consent - to name a few things. The fears are a bit overblown but the app does give access to user information just as other apps do. 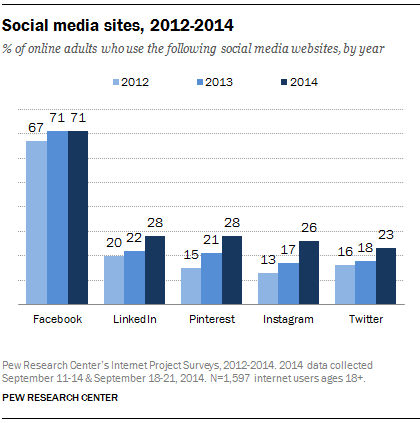 The Pew Internet Research Group released their Social Media Update report for 2014 in January 2015. 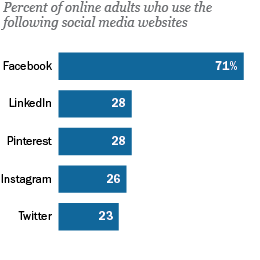 As you can see from the figures above, Facebook remains the leader.